A renewal of airstrikes by the Netherlands against so-called Islamic State in 2018 has been accompanied by some improvement in public transparency, an Airwars assessment of the first two months of the campaign has concluded. While the Netherlands remains less transparent than the UK, changes to the way it publicly reports on military actions now place it on a par with France, one of the more transparent nations in the US-led alliance. Airwars Dutch advocacy officer Koen Kluessien welcomed “this positive move”, while encouraging the defence ministry to go further. Since the renewal of its mission on January 5th, the Netherlands has included the location of the nearest large settlement to a Dutch strike in its weekly updates. Previously no locational data was provided – leading Airwars repeatedly to identify the Netherlands as the least transparent member of the 13-nation Coalition. However, despite recent improvements the Dutch defence ministry still does not state on which precise date it conducted its actions, something the UK has been doing since the beginning of the war in 2014. That in turn means Dutch actions cannot be cross-referenced against specific public claims of civilian harm – a key demand from Airwars and others advocating for better public transparency. “The improved reporting is a step in the right direction, but the Dutch Defense Ministry could do better. An advanced democracy like the Netherlands should be leading the way when it comes to public transparency and accountability,” said Kluessien, who has been closely monitoring the renewed mission. The Dutch rejoined the US-led Coalition with six F-16s on January 3rd, from an airbase in Jordan. This is the second time the Netherlands has taken part in the fight against ISIS. Military operations first began in October 2014, with the campaign paused in July 2016 when Dutch F-16s swapped out for Belgian aircraft. The move towards greater public transparency has brought the Netherlands more into line with all other active Coalition partners. 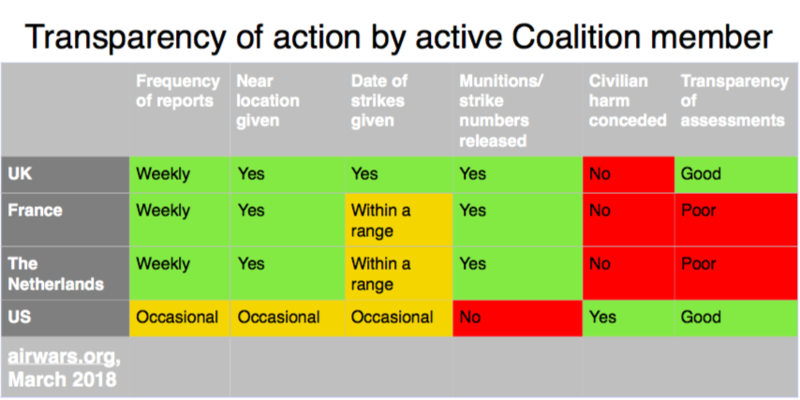 Among the four known active members, the UK remains the most transparent – publicly reporting on the date, location and target of each strike. France and the Netherlands now publish the same level of data – saying roughly where they bomb in any given week – though not precisely when. An Airwars graphic showing improved Dutch transparency and public accountability – now on a par with the weekly reporting of the French defense ministry. Airwars director Chris Woods had already warned Dutch MPs at a November 29th parliamentary hearing in The Hague, that the Netherlands risked being remembered as the least transparent partner in the entire Coalition against so-called Islamic State. This concern was later echoed by several Members of Parliament in a plenary debate on the renewed missions against ISIS. Perhaps as a result of that motion – and of the long running campaign for more transparency from Airwars and others – the weekly reports accompanying the renewed Dutch campaign marked a relative improvement in transparency. The first update was issued on January 10th by the defense ministry and reported that for the period of January 3rd-9th its F-16s deployed weapons during one mission near Abu Kamal in Deir Ezzor, Syria. Since then, a total of almost 20 Dutch airstrikes have been reported. While the more detailed weekly reports mark a welcome step towards greater accountability, the Dutch defense ministry still insists that hundreds of Dutch airstrikes in Iraq and Syria have never led to any civilian casualties since 2014. Even with improved airstrike reporting by the Netherlands, it remains difficult for affected victims to understand responsibility. 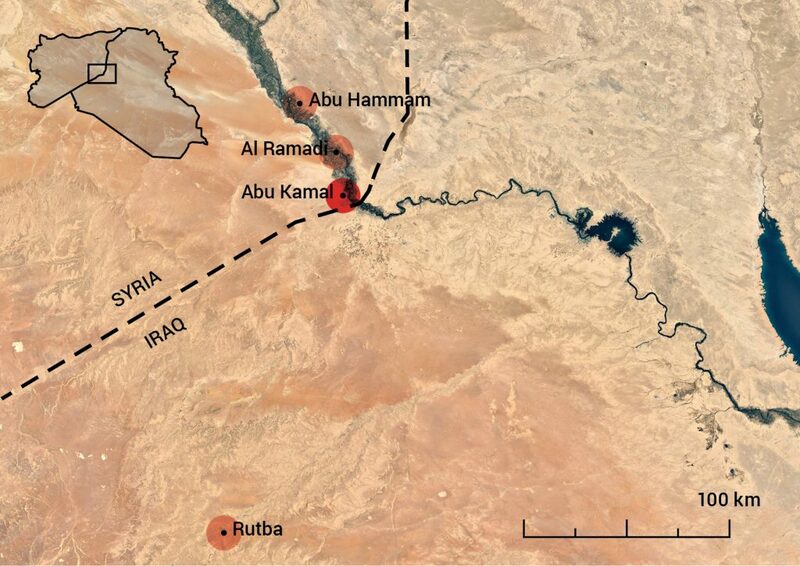 Between January 3rd and February 27th, our Syria researchers tracked and assessed 19 civilian casualty incidents allegedly tied to Coalition strikes in the vicinity of Abu Kamal and Abu Hammam. Of these 19 events, Airwars presently evaluates 15 as fairly reported and estimates that between 104 and 249 civilians likely died in these incidents. However, with multiple belligerents bombing the region from the air – and the Netherlands not providing specific dates of strikes – attribution for recent events has proven to be challenging. An Airwars map showing the general location of Dutch airstrikes from January 3rd until February 27th. Nearly all of the 19 missions in which weapons were deployed occurred near Abu Kamal and Abu Hammam in Deir Ezzor, Syria. Despite recent improvements, for airstrikes conducted during the first leg of its anti-ISIS campaign the Netherlands is sticking to its former levels of poor transparency and accountability. At present, almost nothing is known about Dutch strikes between October 2014 and July 2016, even though Dutch F-16s fired more than 1,800 munitions. Official data suggests that the Netherlands may at times have been the fourth most active member of the Coalition – after the US, UK and France. However, all freedom of information requests for information on the Dutch campaign have so far been refused.